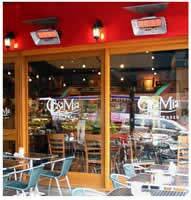 Infraglo, the Sheffield based manufacturers of gas fired infrared heaters and burners have installed six 7KW overhead heaters in the outside dining area of the "Italian Restaurant of the Year," Casa Mia in Leeds. Bringing a warmth and ambiance to Casa Mia's 12m x 6m continental exterior, Infraglo is promising cost efficient heating all year round. "Each individual heater is connected to the gas mains so they are an extremely effective way of heating without the hassle of having to change a gas bottle," commented Francesco Mazzella, Proprietor. The Flamrad heating system is wall mounted at a distance from the dining tables, this ensures comfortable localised heating. "The wall mounted heaters are ideal, giving wrap around warmth and yet are out of harm's way," he said. With instant radiant heat, the Flamrad series provide a uni-directional heat source which creates a warm 'al fresco' dining environment. The individually wall mounted heaters ensure floor space is maximised. "The heaters have created available floor space which means I have room for more tables and the customers love them, we've had lots of compliments about the whole outside area, it's always busy," added Francesco. The Flamrad 700 series enable outside eateries to extend summer trade, by offering a pleasant dining climate all year round. While more restaurants, pubs and cafes embrace the concept of 'al fresco' eating, the need for subtle yet comprehensive heating is growing. "Trade has improved outside since using the heaters, we use them seven days a week now" he commented. Infraglo's sympathetic design features will provide unobtrusive warmth all year round whilst significantly reducing running costs.